List 7 things that you love and then pass the award onto 7 bloggers you love! 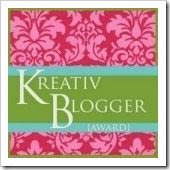 You can copy and paste the picture of the award and put it in your sideboard and let everyone know you are Kreativ! 7) The internet, I would be lost without it!